In 2007–08, almost 10% of households with children reported that they had been uncertain of having, or being able to acquire, enough food to meet the needs of their family because they had insufficient money for food at some time or times during the year.1 Lone-parent households were far more likely to worry about having enough food, with 22.9% of such families saying that was the case. Lone parents were almost 4 times as likely as two-parent families to face food insecurity. 1Health Canada. 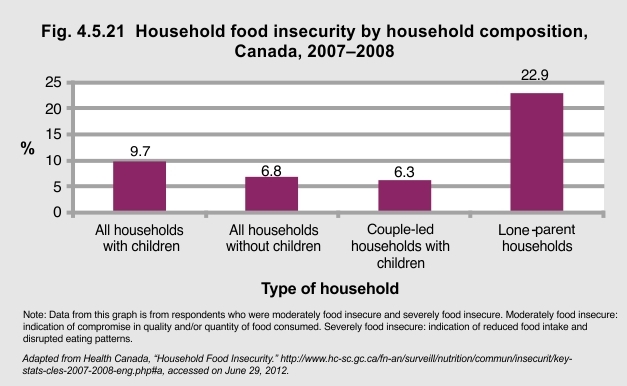 “Household Food Insecurity.” http://www.hc-sc.gc.ca/fn-an/surveill/nutrition/commun/insecurit/key-stats-cles-2007-2008-eng.php#a -accessed on June 29, 2012.